ride will finish around 10:30 at Third Beach. friendly world will look like. Oh yes, please come dressed in your work costumes. music and even more dancing. Doors open 7pm. Heritage Hall 3102 Main Street. Description: Video In Studios, 1965 Main St.
Join Hadas Levy of ParaDocs Productions, Conrad Schmidt of the Workless Party, and some special guests, to see and hear about the American experience with freeways and some great Vancouver-bred alternatives. Films followed by discussion, music and dancing. Snacks and drinks available--bring your own mug! You are invited to join hundreds of fellow cyclists for a leisurely ride through the streets of Vancouver. Enjoy the safety and comfort of the car-free space that we create by simply riding together. how about a full-on funerary procession? widow veils. bike trailer caskets. vanc & various countries for a given year. but connected with those places in some way. just a reminder that this ride is just around the corner. you probably heard about the fatality in chilliwack last week. 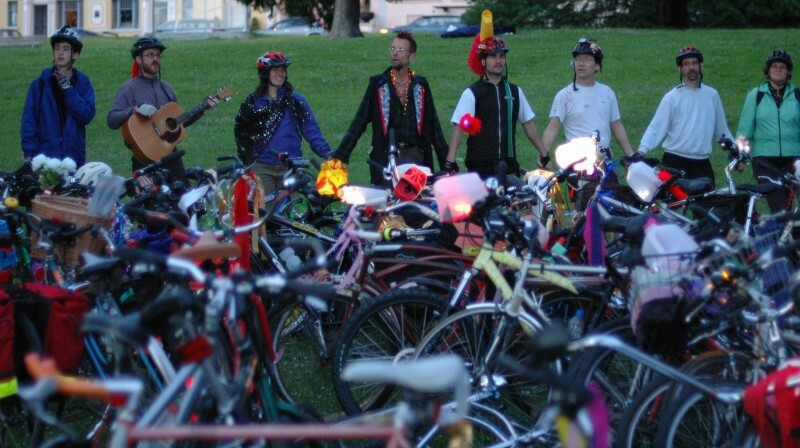 So apparently there is a gathering to begin to plan for the June 2006 Massive Critical Mass. 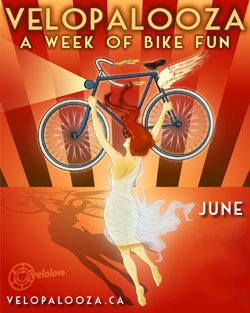 In case you didn't know, June is Bike Month. 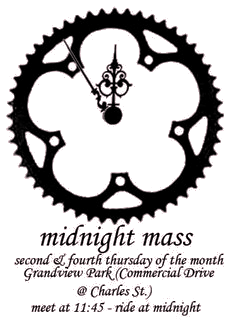 So, in June, we make an extra special effort have a really big Critical Mass Ride. This started a few years ago with the 1000 wheels Ride which was meant to have 500 riders but broke that goal with about 800. We didn't even need our fudge factor where 1 rollerblader counts for 8 wheels. Last year, it was called the 2000+5 wheels ride and there were 1200+ pedallers, skaters, pullers, pushers, agitators, joggers... It was super fun. So of course this year we hope to surpass last year but there hasn't been a good name decided yet. Redsara suggested 20,000+6 which I think is maybe too ambitious but you never know. In Budapest they had an irregular CM with 30,000 people and Budapest was not formerly known as a cycling city! So come out and help make this June 30th, 2006 super duper spectacular. This Friday May 12 is the monthly MC3 ride. So, just before that, on a Friday when CM people are normally avaliable, let's meet. The time is 6pm and the location is the big glass Gazebo next to Science World [Quebec and Terminal, Vancouver]. ALL are invited! There will probably be some more meetings. Or, host your own meeting that fits your schedule and announce it and invite us all to it! 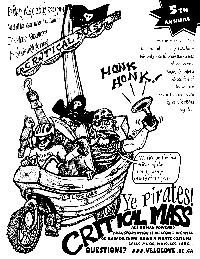 [It's Critical Mass so we're ALL in charge.] Bring your voice, warm clothes depending on weather, and your bike for a ride later on with the MC3. All are welcomed. Car-Free Commercial Drive Festival volunteers desired! Come play in the street  East Van style. by the people of The Drive, for the people of The Drive and our guests. The Festival gave us a day to celebrate the unique multi-dimensional spirit of our community, and to experience our space reclaimed from cars and given back to people. The Commercial Drive Festival was successful way beyond our imaginings. Around 25,000 people participated, including over 250 volunteers. The Festival is completely volunteer organized and presented (including performances). Many of the organizers and day-of volunteers reported that the experience of participating in the festival opened new doors for them in connecting with their community, meeting cool funky folks, and playing a part in the creation of a magnificent event. So, we are doing it again! This year's Fest will happen on Sunday June 18 -- Fathers' Day. The street will be closed again to all motorized traffic, from First Ave to Venables and from Woodland to Salsbury. This year's Festival will also include Victoria Park, the World Cup Zone, to celebrate East Van's multicultural fabric around the theme of soccer, the "international sport." Buses will be re-routed along Victoria Drive. Programming will happen between noon and 6, but the hours of street closure will be from 10 am to 8 pm. Of course, we can't do this Festival without you. This is your invitation to help co-create the dream. We need some helpers before the Fest, to poster and flyer and paint banners and assist with community liaison. The rewards of joining the Car-Free Commercial Drive Festival Crew are many, including delight, satisfaction, connection, and bigtime karma. Plus you'll get first crack at t-shirts, and you will be in the loop on the volunteer afterparty, which is sure to bump the 'hood. Tell your friends about the Fest. Post it to your networks. Join in creating the Car-Free Commercial Drive Festival, and start reclaiming your street, your neighbourhood, and your planet...for fun. Thanks evermuch, see you on The Drive! p.s., if you worked on the Fest last year and have suggestions for how to do it better, speak up!